What Everyone Must Know About The US Dollar: Sea Change Coming? As we reviewed last week’s market action and its lessons for this week, we wanted to alert everyone to something very significant that may be happening with the US dollar and why it matters so much. One of the most potentially important charts of the past week came from Morgan Stanley’s currency team, which in essence suggested that the USD may be evolving from a safe haven currency into a risk currency. That means that how the USD both influences and is influenced by other markets could be reversing its normal behavior. Given that the USD is the currency in which most commodities and international business is priced, this has potentially huge ramifications across multiple global asset markets like stocks, commodities, bonds, and especially on currency markets, where about 80% of all currency pair transactions (currencies almost always trade in pairs) involve the USD etc. For those not familiar with the terms, a quick review is in order. They’re critical for understanding how different kinds of assets correlate and for understanding how different asset markets influence one another. Here is a table showing how the major currencies rank. By definition, a risk currency moves in the same direction as other risks assets like major stock indexes, and in the opposite direction of safe haven assets like investment grade bonds. Safe haven currencies move in the opposite direction. For example, the AUD is the top ranking risk currency on the risk spectrum BECAUSE it tends to move most strongly with risk assets, rising in times of optimism as reflected in major global stock indexes or other risk appetite barometers. The JPY is the lowest ranking on the risk spectrum (and thus the highest ranking safe haven currency) BECAUSE it tends to move most strongly in the opposite direction. These labels definitely DO NOT refer to the relative safety of a currency as a long term store of value. Indeed an excellent case can be made that the two top ranking safe haven currencies of recent years are far less likely to hold their value versus currencies like the CAD that rank higher on the risk spectrum. 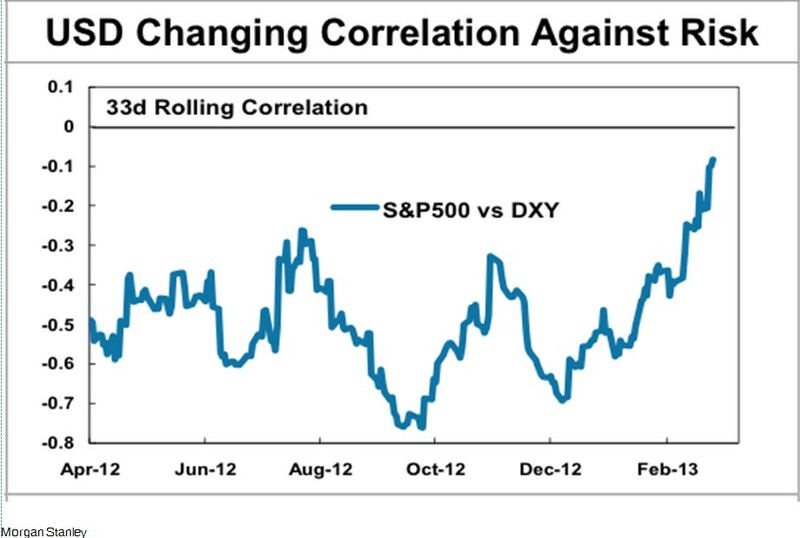 For many years, the USD’s has moved in the opposite direction of risk assets like stocks. As the above table shows, it’s been the #2 safe haven currency, or #7 risk currency. a) While there are many potential reasons for this, the main reason for risk rankings is that the higher the benchmark interest rate set by the currency’s central bank, the higher the currency ranks on the risk spectrum. Indeed this relationship holds in all cases in the above table. Australia offers the highest benchmark rates, New Zealand the next highest, and so on, down to Japan. b) Of equal importance is the anticipated future direction of interest rates. In other words, currencies with lower rates but which are expected to see rate increases relative to higher yielding currencies, and thus close the gap between their relative rates, should appreciate in value against those other currencies. While there are other factors that also influence risk ranking and behavior, the news headlines and speculation that most influences currency prices involve the factors that most influence current and future benchmark interest rates. In times of optimism, markets want currencies with higher yields, either to collect that interest, or to purchase assets in those currencies with higher yields as those assets, as a group, tend to yield more. These purchases tend to be funded by selling lower yielding currencies. These kinds of trades based on profiting from rate differentials are called carry trades. In times of pessimism, those trades and investments unwind and markets flee into the lower yielding currencies as the higher yielders are sold off to pay for purchases of the safe havens. They noted that the USD index had recently started behaving more like a risk currency, or more precisely, more like the S&P 500 index, a classic risk asset barometer. If you compare current rate differentials, the USD is still second from the bottom when comparing the benchmark Fed Funds rate to those of the other currencies higher on the risk ranking spectrum (though it may be moving up in some secondary benchmarks). This is a classic case of how anticipated shrinking future rate differences with other currencies are causing the USD to both appreciate and to behave more like a risk currency. In other words, the US benchmark rates are expected to rise relative to those of the others. Although European stocks are still rallying, forex traders understand that Europe is deteriorating and that it’s a matter of time before both the ECB and BoE start new stimulus and money printing. Japan has already said they’re going to print and debase the JPY, though they too, like the Euro-zone, have so far only talked about it. Meanwhile the US is already actively pursuing QE 3 and its economy is doing better relative to the EZ, UK, and Japan, the sources of the #2, #3, and #4 most widely traded currencies. The Fed has said it will begin tightening when US unemployment hits 6.5%. Until last Friday it was making modest progress. The latest monthly US jobs report this past Friday showed that unemployment fell from 7.9% to 7.7%. If that 0.2% drop per month rate of improvement continues, that target will be hit in 6 months. If it just continues until 7% markets will start anticipating tightening if they haven’t already. In other words, US rates are headed higher, possibly within the next 12 months. Other tightening may come sooner as the Fed seeks to ease markets off life support slowly. Meanwhile, the other most widely held currencies are moving will be easing and thus devaluing versus the USD. Warning: The fact that the USD rose Friday (along with stocks, the classic risk asset) after the good jobs report should not be taken as some kind of decisive proof that the dollar is indeed becoming a risk asset itself. The USD rose because markets know that jobs are the key metric the Fed is using for timing its exit from loose, dollar-debasing monetary policy. That, in the short run at least, will be bad for growth assets like stocks because there won’t be the flood of cash inflating financial asset prices, nor will there be the ultra low rates that encourage yield seekers to go into stocks rather than bonds. In sum, the USD rose after the jobs reports because those reports raised expectations of higher rates and an end to loose monetary policy that threatens further USD devaluation in the long term. Rising rates benefit the USD but they hurt risk assets. I hope the good people at Morgan Stanley are clear on this. Friday’s USD rally did NOT imply the USD is becoming a risk currency. The USD should remain a safe haven currency because its benchmark rates remain low. It may start acting more like a risk asset, but only if data continues to raise expectations for tightening and rate increases. Confused? Stay with me here. Anticipated narrowing rate differences may feed USD demand in times of optimism. Meanwhile, as long as US benchmark rates remain low, the USD should retain its use as a funding currency for carry trades and thus should retain its safe haven appeal in times of trouble. Also, the entrenched tradition of fleeing to the USD in times of trouble is likely to continue simply for lack of an alternative with enough liquidity to absorb all the demand. If the EU is the source of the next market scare, the USD is virtually assured to rise, because the EUR would sell off. As I’ve explained in the past, for technical reasons (which I’ll skip here), the EURUSD tend to push each other in opposite directions. When one is being bought, the other is being sold, and vice versa. 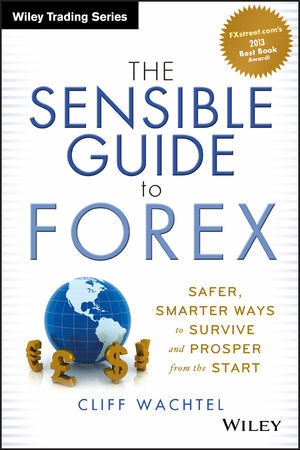 For a full explanation of the above, consider my book, The Sensible Guide to Forex. You can find a lot of free information from it using the “Look Inside” feature on its amazon page here. As governments continue to attempt to manipulate their economic performance via manipulating their currencies, however well intentioned they may be, it’s more important than ever for investors to understand the basics of what drives currency markets and how they influence other markets and signal changes in those markets. Don’t get distracted by short term currency movements. As long as the folks at the Fed, ECB, BoJ and BoE believe want to cut the value of the USD, EUR, JPY, and GBP, then all of them are going to lose ground against both hard assets and better managed currencies. The same goes for any other currency subject to similar dilutive policies. Anyone heavily exposed to these currencies will see their wealth dragged down with them. Just because you spend in that currency does not at all insulate you from the effects of a devalued currency (though I’m constantly amazed at how many bright people think otherwise). Just think about how many goods and services you buy either contain imported inputs or inputs that are subject to global prices. Fortunately you can achieve both of the above without a lot of work, and you don’t have to get involved with demanding, risky styles of currency trading. There are ways to benefit from currency trends that are no riskier or more demanding than stocks or bonds (ok, perhaps not the best recommendation these days). See here or here for more information about my book, written specifically to help with both, or just search The Sensible Guide To Forex. It recently sold out at amazon and other online retailers but I’m told will be restocked shortly.